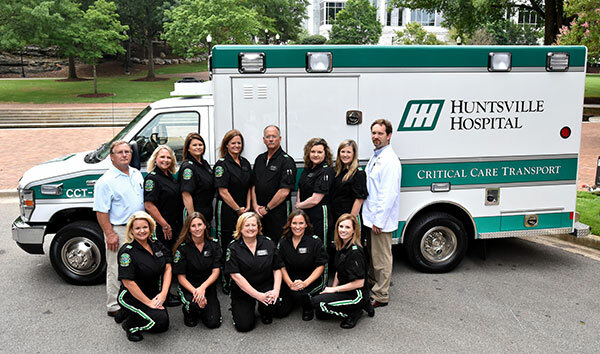 Critical Care Transport (CCT), established in 2005, specializes in transporting critically ill patients from one medical facility to another within 150 miles of Huntsville Hospital. Transports exceeding 150 miles will be considered with advance arrangements. Complete arrangements for bedside-to-bedside transports are made by the Transfer Center. Every transport includes both a registered nurse and paramedic to provide uninterrupted patient care. Depending on the patient’s needs, a critical care respiratory therapist or cardiovascular technician may also be asked to ride along. Our medical team has over 200 years of combined nursing/EMS experience. Each team member holds certifications in Basic Cardiac Life Support, Advanced Cardiac Life Support, Pediatric Advanced Life Support, Neonatal Resuscitation Program, and Trauma Nursing Core Course. They also carry the Certified Emergency Nurse (CEN) designation. All of our nurses are trained to perform advanced medical procedures such as intubation, rapid sequence induction and needle chest decompression. Each vehicle is climate controlled with a 12v/110v system that allows for heating and cooling of the units to maintain operating temperatures while parked or on a mission. The Braun unit has a diesel generator that will power the patient compartment and all necessary equipment. The generator will also power emergency warning lights should the unit have a maintenance failure. Critical Care Transport is available 24 hours a day, 7 days a week. For transport please call 1-877-265-3344.